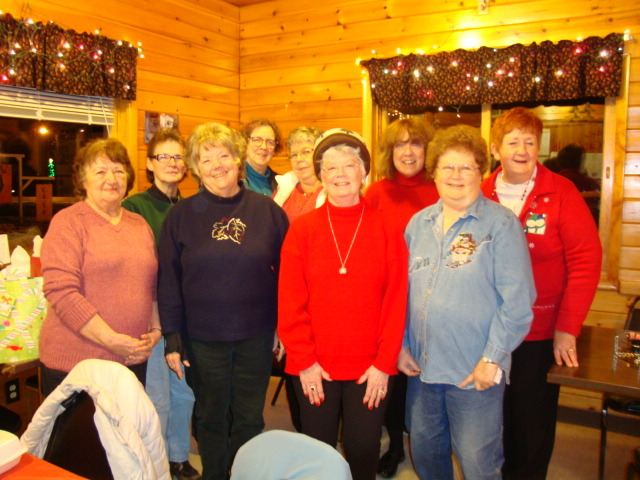 Monday Evening Club members of 2015 included: (Left to right) Barbara Gardner, Dee Lowney, Eileen Bentzen, Sharon Graham, Marge Larson, Laurie Perkins, Ceil Held, Marge Ogren and Jill Corr. Also members but not shown are: Jackie Walen, Soney Rockenbach, Jeri Ogren, Jean Thill, and Holly Hob. Monday Evening Club members are often asked: Where did you get your name? The obvious answer is because we meet on a Monday evening, The Club was started sometime in 1945 while many of the area men were gone due to World War II. Some of the ladies decided they would like to get together for a night of enjoyment. The Monday Evening Club was born. 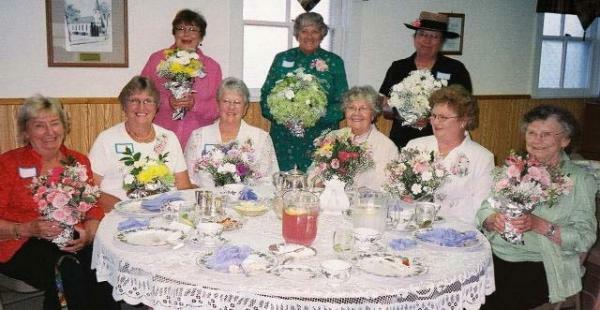 Charter members were: Elsa Weborg, President, Betty Helsing, Vice-President, Barbara Iverson, Secretary-Treasurer, Evangeline Moore, Margaret Hogfeldt, Ruby Colen, Mirima Forsberg, Corrinne Voight, LaVerne Hogfeldt, Viola Anderson, Gertrude Wigren, Ethel Schmallenberg, Linnea Klovstad, Jean Homa, Esther Swanson, Edith Bloomgren, Marian Forsberg, Virginia Bodeen, Helen Swenson, Helen Johnson, and, it is thought, Betty Johnson. Over the 70 years the Monday Evening Club has been in existence there have been many changes in the small, unincorporated town of Port Wing, and, naturally, there have been many changes in the Monday Evening Club. Members have passed on, new members have been added, and activities have changed over the years. Still, the ladies’ group continues on with its main emphasis being a social gathering of community minded area women. Our main fundraiser has been the Annual Christmas Craft Sale, held the Saturday after Thanksgiving at the Town Hall, Recently we have also served dinner for a national Bike Tour group which has been coming to Port Wing every two years. The Bicyclists voted our town “the best town to visit”! Intelligent bunch, those bikers! The Monday Evening Club has supported a multitude of area projects including an annual roadside clean up, giving scholarships to South Shore School students, Town Hall upkeep, Christmas decorations, a television for our new fire hall, made donations to our EMTs, firemen and women, among many charitable donations with funds from our projects. 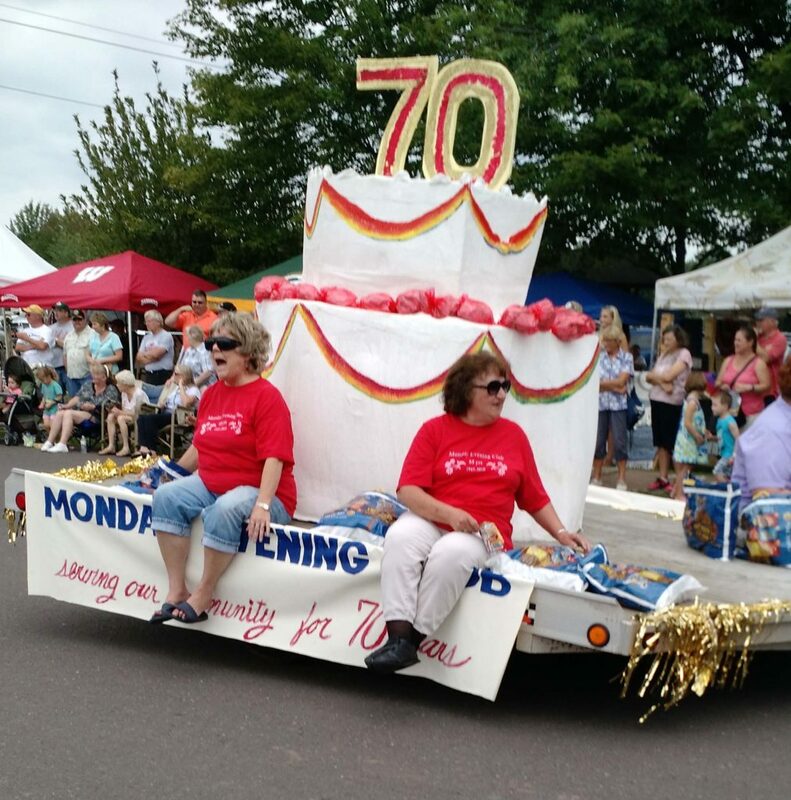 A traditional annual event is our entry into the Fall Festival Parade every Labor Day weekend, which is normally a humorous spoof of some kind; however, this year, we made a simple 6 foot tall cake to celebrate our 70th birthday. Traditionally, if you would like to become part of the Monday Evening Club, a member would ask you to join, and then you would be approved by the membership as a whole. All you have to do is get the word out there, and you could become part of this group. We hope to be welcoming you soon!